Creating Panoramic Images Is Not A Snap. Occipital recently released 360 Panorama in the App Store. 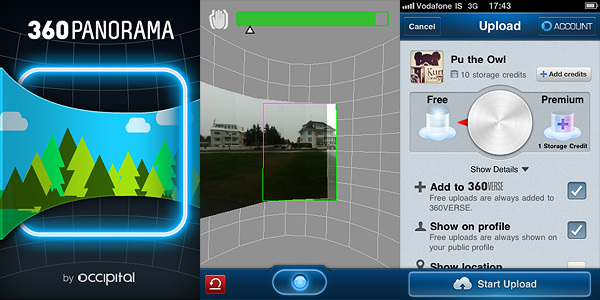 As the name suggests, the app is a 360° panoramic photo creator, one of the many already available for iPhone. The app also runs on iPad 2 and iPod Touch 4th generation. Send via email or share on Twitter and Facebook (requires 360 Verse account). As soon as you start the 360 Panorama, you are immediately introduced to the main screen, whose most noticeable feature is a curved grid that will help you in taking straight shots to assemble your panorama. By tapping on the shutter button, you set the starting point of the panorama creation. While panning around, the app automatically takes consecutive shots to be merged at a later stage. As soon as you have enough shots, you tap again on the shutter button and let the app do the rest. After the panorama is assembled, you can decide to save it to your camera roll, to send it as a flat image with email or to share it as a 360° view. To take advantage of the latter, you must create an account to 360 Verse — the portal connected to 360 Panorama — through in-app registration. The free account has only limited features and storage capacity, but if you want you can upgrade to a Pro account by purchasing credits from within 360 Panorama. Note to developers: adding an extensive and clear in-app guide to the whole ordeal would help more than a few users, I am sure. 360 Panorama has very basic options: you cannot do much to enhance your panoramic image, apart from trying to be careful when you pan. Using the automated capture feature can be all right in some instances, but most of the times it’s definitely too problematic to handle in order to take accurate shots, especially in absence of a tripod: being able to adjust angle and perspective before the shot is automatically taken is impossible sometimes. After a few unsuccessful tries, the task can become frustrating. iPhone photography should be fun, but making 360 Panorama do its work properly most of the times is not. Especially in difficult lighting conditions (indoors, overcast weather, etc. ), the app seems unable to correctly figure out proper settings on its own and therefore it messes up. The stitching is also intense in most cases (as in image below), making composites useless if not as a momentary curiosity. Panoramic image created with 360 Panorama. Click for larger view. As I see it, 360 Panorama is not the best choice in the App Store if you want a solid and reliable application focused on panoramic images creation. I haven’t tested 360 Panorama on iPad 2, but I assume it must be even more complicated than using it with an iPhone, given the tablet’s size and weight. Unless you intend to use a tripod, creating a decent looking panoramic image in 360 Panorama will be a task requiring too much time and patience to be fully enjoyable. PS: As a launch promotion, you can buy 360 Panorama with a -50% discount. Compatibility: iPhone (3GS, 4), iPod Touch (4th), iPad. iOS 4.0 or later.